Is the U.S. App Store Frozen (Again)? As you know, we track hourly rank changes from all App Stores around the globe. On Wednesday we noticed odd behavior from every app store—suddenly they were all stuck. For eight hours 99% of apps did not budge. We were just about to blog about it and then movement resumed. A fluke, we thought, wandering away from the single legal pad we’d all been crammed around. But then it happened again! The U.S. App Store’s been frozen for the last 24+ hours! On average, 65-95% of apps move in the U.S. store every hour. Actual increases and decreases in rank depend mostly on the time of day, with midday (1pm – 4pm) seeing the heaviest movements. This is true for both iPhone and iPad apps. 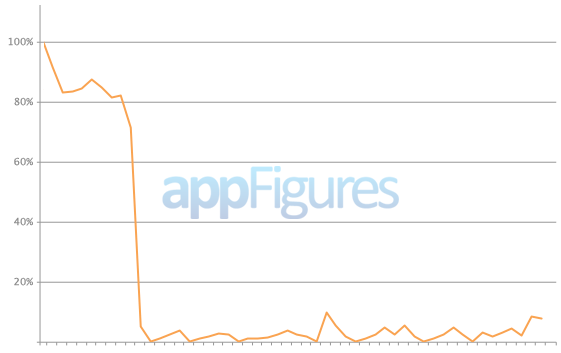 Since 4am yesterday the percentage of apps jockeying for rank has dropped dramatically to just 0.5% – 4.5%. What’s also interesting is that of the small percentage of apps that did move, the majority weren’t in the top 100, and they were restricted to just five categories, while every other category remained motionless. Weird. Is Apple changing its ranking algorithm? Are the current ranks being pulled from an old cache while Apple tries to fix a problem…and is Apple having the same difficulties they had a year ago? Assuming we find out what’s behind Apple’s strange behavior, you’ll be the first to know. It’s days like this I’m glad we keep a private investigator on staff. Kind of. Stuck up high? Stuck down low? Stuck entirely off the grid? Share your frozen experience. EDIT (11/1): It’s been more than three days since the rank freeze and still nothing has started to thaw. A commenter in our community had an interesting observation that may hint at the cause of the few changes that have occurred during the freeze. These few movements we have seen tend to be single up-shifts of large groups of apps—usually ten or more. It looks like each of these movements is the result of a single app being pulled out of the list, enabling every app below it to shift up one spot. Although any explanation for this bizarre behavior is still speculation, apps miraculously disappearing from a rank list appear to have a correlation to a price change. More specifically, we think the common trait among all the apps that have been dropped from the frozen rankings is that they have all been changed from free to paid, or from paid to free. Has your private eye found out anything yet? Still frozen…. Those wierd ‘movements’ you say, I’m fairly sure they are apps changing from Free to Paid and no app is moving above any other apps… They are just moving up as other apps above them change from Free to Paid and change lists. It’s been almost 4 days and the App Store Rankings are still FROZEN. Well, personally for me the behaviour has gone completely mad. After the aforementioned FREEZE, my app (in Sports, UK) has been fluctuating all over the place from 7th in the paid chart, all the way to 20th. It’s up and down like a Yo Yo. In an hour I can observe it going up and down probably every 5-10 mins. The worst part is this is now affecting sales in my opinion. There is an obvious benefit to being in the Top 10, but now I’m jumping in and out of there like a yo yo… not good.